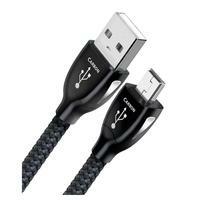 Get the big silver advantage with Carbon USB cable from AudioQuest's 'Indulgence Series.' Boasting solid 5% silver-plated Long-Grain Copper (LGC) conductors, Carbon delivers low jitter, low distortion audio. Enjoy Carbon USB cables with PCs, DACs, and other digital gear, and experience how good digital music can sound. AudioQuest has a well-earned reputation as a manufacturer of exceptional analog audio cables. However, the advent of USB presented a new set of design challenges that needed to be solved. In order for AudioQuest to maximize audio performance over USB, new materials and higher levels of manufacturing precision were employed to handle the high-speed, wide-bandwidth signals. Several of the analog audio design elements that have proven so important over the years turned out to be meaningful to USB signal design. Solid core conductor technology, conductor metallurgy, insulation material and overall precision of manufacture have all been carefully optimized to create a superior line of USB cables.